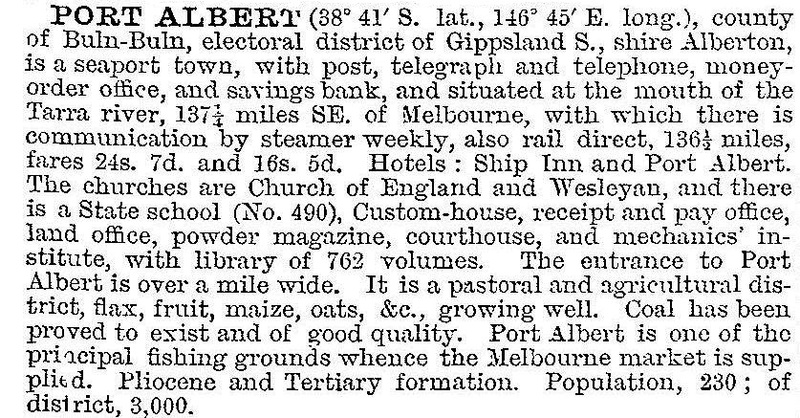 Port Albert is located at Shipping Point on Corner Inlet, Gippsland, about 175 km south-east of Melbourne. Pastoralists moved into north Gippsland from the Monaro, New South Wales, from 1835. Searching for a port for easier access to markets, Angus McMillan reached the coast near the mouth of the Albert River in early 1841. Around the same time, the steamer Clonmel was wrecked nearby and rescuers carried reports of the area to Melbourne. The Gipps Land Company was quickly formed, mounting an expedition to Corner Inlet and establishing a depot at the mouth of the river. Soon cattle from the inland pastoral runs were shipped to Van Diemen's Land and several merchants established goods stores on the eastern side of the inlet below the Albert River ('Old Port'). Operations were shortly moved to Shipping Point, a headland to the east, south of the mouth of the Tarra River, where deeper water facilitated loading. Two Special Surveys were selected in the area. A private township, Tarraville, was established on one of these, flourishing due to its location on the route from the new port to the hinterland. 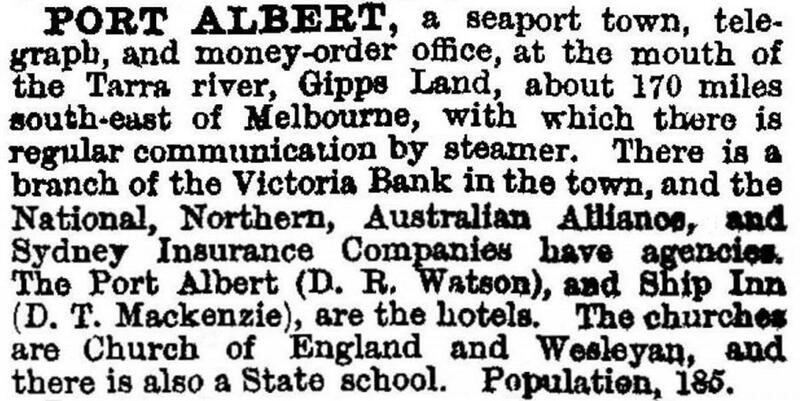 A government township named Alberton was laid out east of the Albert River but was slow to develop. River and town were named after Prince Albert, Queen Victoria's consort. The land around Shipping Point was sold privately in 1843. It was soon acquired by Turnbull, one of the merchants at the Old Port. Despite low swampy land and a lack of fresh water Port Albert, sometimes called New Leith, became the centre of operations and the first settlement was abandoned. A hotel, stores and a customs house were soon built and a jetty and stockyards constructed. The discovery of gold in north Gippsland from the 1850s boosted Port Albert's prosperity. The Port Albert Steam Navigation Company ran a regular steamship service, landing prospective miners, mining machinery and supplies. A powder magazine was built on the foreshore and the Bank of Victoria established a branch in 1856. Port Albert's importance gradually declined. The Gippsland Lakes were opened to navigation, allowing steamers direct access to the provincial towns of Sale and Bairnsdale. By the late 1870s, Gippsland had overland road and rail communication with Melbourne. The customs office closed in 1903 and shipping services soon ceased. Although greatly diminished in size and status, Port Albert was sustained by its fishing industry. At first, dried fish were exported by Chinese, but from the 1880s fresh fish were sent away by steamer and by rail from Sale. In 1892, the railway from Melbourne into South Gippsland reached the port, facilitating exports. It closed in 1949. Port Albert was renowned for flounder but by the 1930s shark fishing became important. Port Albert has good port facilities to serve the commercial fishing fleet, numerous recreational fishers and boating enthusiasts. Many old buildings still stand, recalling Port Albert's heyday as the port of Gippsland, although the Port Albert Hotel burnt down in 2014. The old Bank of Victoria (c1861) houses a Maritime Museum which displays relics and records of Port Albert's past. A walk from the Old Port to the Port Albert foreshore highlights the native vegetation and places of historical interest. There are also shops, a recreation reserve, a caravan park, a hall and an Anglican church. The seawall underwent maintenance in 2014. The median age of residents at the 2011 census was 57 years (Australia, 37 years).